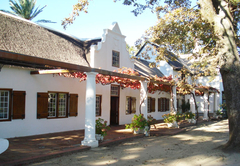 Lekkerwijn Country Guest House is a guest house with self catering option, providing accommodation in Groot Drakenstein for tourists visiting the Cape Winelands region. 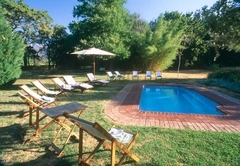 Lekkerwijn offers a unique and memorable experience for single travelers, couples, families or groups - an historic Cape Dutch Homestead with magnificent gardens with swimming pool set in the heart of the Cape Winelands. 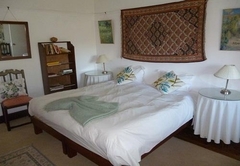 Lekkerwijn Country Guest House offers traditional warm Cape hospitality that caters for those in need of a tranquil break and for the modern traveler. 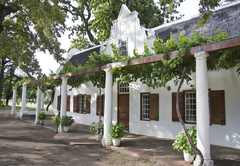 Lekkerwijn has seven bedrooms in the Homestead and one self catering cottage and can sleep up to 16. Camelia: In the original master bedroom, this beautifully appointed room with walk-in closet and luxurious en-suite bathroom and shower resounds with the simple luxury of polished wood and fine linen. York: In a spacious room off the internal courtyard, twin beds face out over a tranquil garden. This traditional room has with brass beds, beautiful blue and white wash stand tiles antique furniture and a modern en-suite with bath and shower. Up the main staircase in the airy lobby is the upstairs bedroom wing that was added by Herbert Baker in 1907. Filled with paintings and drawings by the Pickstone family, this former children’s wing offers commanding views of the parkland and the valley. 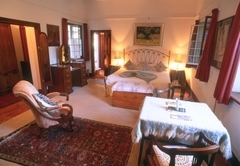 Old Nursery (twin beds): The former Nursery looks over the valley towards Franschhoek. The stylishly renovated en-suite bath and shower room has the best vantage point of Lekkerwijn’s graceful oak-lined driveway. 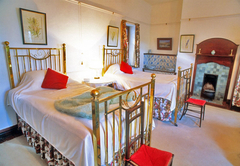 The large twin beds can be pushed together, depending on the preference of guests staying. 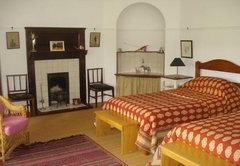 Peacock Suite: This comprises of a double bedded room and a bedroom with bunk beds. These bedrooms share the recently renovated bathroom between them and look across the flower garden and vineyards below towards the Drakenstein mountain range. Guests only share the bathroom if they are in the same party. This unit is ideal for a couple using the double room or a family with children. Owl Corner: The north end of the upstairs bedroom wing has a door allowing a private area consisting of a double bedded room, a single bedroom and a small bathroom with shower. This delightful self-catering cottage is part of the farm’s outbuildings. While offering a relaxed, more self-determined environment the Coach House retains the simple elegance that embodies the Main House. 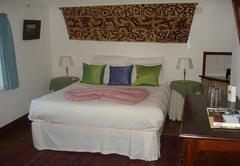 The Coach House cottage’s large double bed and day bed, sleep up to three persons. 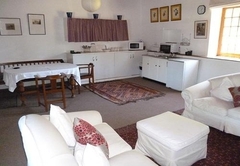 The cottage has a kitchenette and dining area, as well as relaxing sitting room area with TV. A recently converted historic outbuilding with ensuite shower room, living area and its own private garden. Breakfast is served in the magnificent dining room, full of Cape Dutch antiques, or can served in the internal courtyard with garden if you prefer. 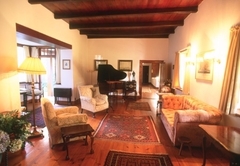 There are many private spaces for guests to enjoy, including two sitting rooms, one with baby-grand piano and early Cape paintings and a more relaxed TV lounge. Lekkerwijn is ideally situated for visits to the abundance of wineries in the Franschhoek Valley - Boschendal, Allee Bleu and Solms Delta are all within walking distance. 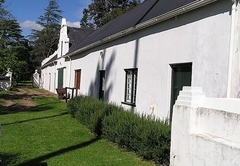 We are well positioned for easy access to the historically interesting towns of Franschhoek, Stellenbosch and Paarl. 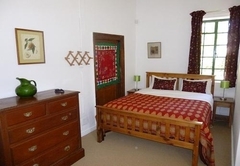 Large twin or double bedded room with en-suite bathroom with bath and shower. Tea & coffee making facilities. In a spacious room off the internal courtyard, twin beds face out over a tranquil garden. This traditional room has with brass beds, beautiful blue and white wash stand tiles antique furniture and a modern en-suite with bath and shower. This comprises of a double bedded room and a bedroom with bunk beds. 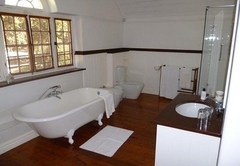 These bedrooms share the recently renovated bathroom between them and look across the flower garden and vineyards below towards the Drakenstein mountain range. Guests only share the bathroom if they are in the same party. This unit is ideal for a couple using the double room or a family with children. 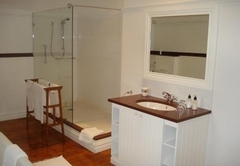 2 double bedded rooms in a separate unit with small bathroom with shower. This private unit has its own stair case leading to the court yard and has easy access to the guest kitchen area in the main house. The north end of the upstairs bedroom wing has a door allowing a private area consisting of a double bedded room, a single bedroom and a small bathroom with shower. 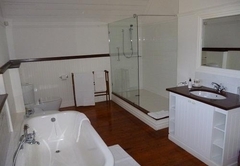 A one bedroom unit with shower room - self contained and private. 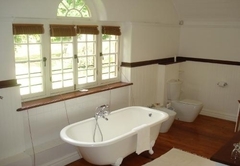 A recently converted historic outbuilding with ensuite shower room, living area and its own private garden. Coach house cottage (nest to stables) has a king size bed with a bathroom with shower leading off it. In the large living room/ kitchen area there is a single divan bed, which can also be used. TV with DSTV. This delightful self-catering cottage is part of the farm’s outbuildings. While offering a relaxed, more self-determined environment the Coach House retains the simple elegance that embodies the Main House. 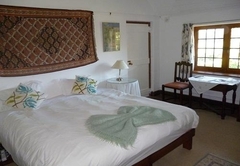 The Coach House cottage’s large double bed and day bed, sleep up to three persons. The cottage has a kitchenette and dining area, as well as relaxing sitting room area with TV. 2 bedroom cottage with large sitting room. There is a bathroom with bath and shower. Guests can choose to do self catering if they wish. This spacious 2-bedroom cottage was a wine cellar, later converted into a ballroom by Harry Pickstone 100 years ago. The large living room with fireplace is as it was. The rest of the ballroom has been revised to include a bathroom, kitchen and two double bedrooms. 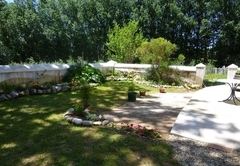 The cottage has a private garden looking on to a persimmon orchard. 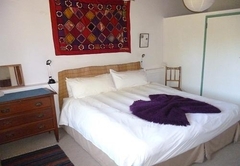 Large double bedded room with en-suite bathroom with bath and shower. Tea & coffee making facilities. This can be made into a twin room if preferred. Please note that when a double it has a large double mattress and is NOT two twins pushed together. The former Nursery looks over the valley towards Franschhoek. 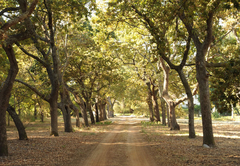 The stylishly renovated en-suite bath and shower room has the best vantage point of Lekkerwijn’s graceful oak-lined driveway. 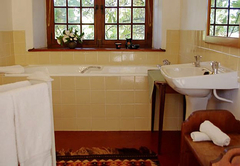 The Wine Cellar Cottage consists of 2 bedrooms, bathroom and living room. It has a kitchen, and living room and dining areas and bathroom with bath and shower. Great for families with kids. Facilities include Bar Fridge Fan Fireplace Hairdryer Heater TV No Smoking Safe Tea and Coffee View Bed Linen supplied Towels Microwave Oven Freezer. Double bedroom with en-suite bathroom shower and full kitchen. Overall, it was a very good experience at Lekkerwijn. The house is truly a museum of 18th and 19th century furniture, craftsmanship and Dutch cape style period architecture. My room was huge with a king bed, sitting area and bathroom. The staff were very supportive and friendly. The owner was very knowledgeable of Franschoek and the valley providing good tour options ad restaurants. Breakfast was good and fresh with eggs/omelettes to accompany the muffins, toast and coffee/tea. I thought the room and house was alittle cold during the evening and the wall heater in the room was not sufficient to warm it up. There was a fireplace in living room but it was not lite. The other issue I had was that I arrived late (after 7pm) and there was no one available to greet me. The doors will all locked, not much exterior light and no visible security person. I finally did reach the owner who let me in and apologized for not having there when I arrived. I just think that part of the process could be improved. I would recommend it to others recognizing the beauty of the area and value for money it represents. Response timeLekkerwijn Country Guest House typically responds to requests in 5-10 minutes.